North Andover, MA —September 27, 2016 – JENSEN Tools + Supply (formerly known as Stanley Supply & Services), the industry’s leading provider of product and services for electronics manufacture, assembly, diagnosis and repair professionals made an announcement today of their latest version of JENSEN Tool Kits that are aimed specifically for professional field service technicians. During a recent interview, Ray Bellavance, Director of Sales & Marketing said, "JENSEN Tool Kits are ideal for professional field service technicians in virtually any line of work. We know it is critical to have quick access to every tool necessary for the job! Whether you’re in Aviation, HVAC, PC Support, Bio Medical or have Military requirements, we can custom build any tool configuration, case style, pallet option, cabinet or drawer system for your industry-specific needs." The general purpose tool kit represents an excellent value for your money and can be used by technicians, electronics service professionals, biomedical repair specialists, field service engineers and on-site service technicians alike. "The demands for tools to be conveniently organized are continuing to grow, which means the use of JENSEN Tool Kits and Tool Control solutions are also increasing," said Bellavance. "At the same time, it is necessary to keep these tools organized and in one place to prevent these essential tools from getting lost or misplaced." He concluded by saying, "We strive to offer the best in quality and originality, which has become the defining factor that separates JENSEN tools from the rest. With over 60 years of experience under our belt, JENSEN is your best option to provide field tested and quality guaranteed tool kits. Look for the JTK® registration mark that signifies an original JENSEN® design." For more details and to see the latest version of the JENSEN Tool Kit Guide, please visit JENSEN’s Web site at www.JensenTools.com. 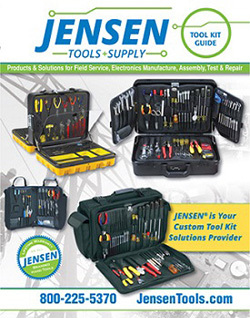 Information about JENSEN Tool Kits and the Custom kitting Solutions can also be requested by contacting JENSEN Tools + Supply directly at news@JensenTools.com or by calling 800-225-5370.